Along with a combination of other drugs, anti-platelet drugs can be used to help in the treatment of some cardiac conditions.Anti-platelet drugs are specially designed medications that interfere with the platelets that are found in blood from collecting, a process known as platelet aggregation. Platelets are parts of the blood that are essential in clot formation and are necessary to stop bleeding however for cardiac patients their aim is to stop clots forming in the blood. Their overall function is to thin the blood; a common example of an anti-platelet drug is aspirin. There are however different types of anti-platelet therapy and the type you are given will depend on your current health status and any medical history you have. If you are advised to take anti-platelets as a preventative measure you will probably be offered a different drug or dose to someone who has a life-threatening cardiac problem already. When the blood thickens or begins to form a clot, the consequences can be fatal. Not only may it lead to a deep vein thrombosis or pulmonary embolism but it can lead to a heart attack. The cardiac muscle has its own blood supply in the form of coronary arteries. Along with other arteries in the body, these can become narrowed by a build up of plaques or become completely blocked, either from the plaque or because a clot has formed. If the blood is too thick it can clot, likewise if the arteries are narrowed and the blood struggles to pass through the vessel, the heart has to work harder to push the blood through the vessel and encourage clot formation. If a coronary artery becomes blocked by a clot or plaque, the muscle will become depleted of blood and oxygen and slowly the tissue can die. This causes angina or a heart attack, which can kill. Anti-platelets cannot shrink or dissolve existing clots but can help prevent existing ones from getting larger or new ones forming. Anti-platelet drugs are safe if they are used correctly and can save lives however they can also be dangerous. If they are taken incorrectly, in the wrong dosage or by patients who are deemed to be unsuitable they can be very dangerous.Always taken as prescribed and remember to tell your doctor of any previous complications you have with your blood, if you have any allergies or sensitivities to drugs or any history of kidney disease or infections. 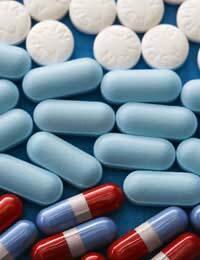 Anti-platelet drugs, especially aspirin can harm the digestive tract and cause bleeding into the stomach or bowel. It is vital that you tell your doctor if you have ever suffered from stomach ulcers or bowel problems as this may influence the type and dose of anti-platelet medication you are offered. If you discover any bleeding from the bowel (represented by dark red or black stools), or any bleeding from the stomach seek medical advice immediately. Anti-platelet drugs are very powerful and can do as much harm as they do good if they are taken incorrectly or by those who are deemed unsuitable. Always inform your doctor of any medical history before taking the tablets and remember to take them as directed. Never take two doses at the same time because you have missed a previous pill as this is very dangerous.